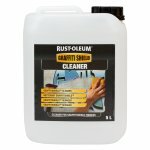 Cleaner / Degreaser for use with Epoxyshield range of coatings. A specially formulated cleaner for use with the Graffitishield range of coatings to remove graffiti from surfaces pre-treated with GraffitiShield HYDRO, POLYCOAT and NANO. Highly effective works in minutes with only a mild aroma so can be used in smaller closed spaces. Apply Graffiti shield cleaner with a cloth or sponge, once the graffiti is dissolved it can be removed with a cloth or sponge and the surface rinsed with clean water.